Have I mentioned briefly that I train with an ex-Marine…Jon Stratford (www.commandoactive.com), well today he seriously put me through my paces. Every trainer I have ever worked with does seem to think it their life’s mission to make me do as many press ups as possible. Jon has discovered ways of disguising them as something else, but I am getting slowly wise to it, though not I fear better able to do press ups! Step ups are however another matter – and as I seem (I hope) to do them with relative ease they are slowly transformed into something else – the box I’m stepping up onto gets slowly higher, the weights slightly heavier, and not only do I have to step up onto the box, but over the other side then back up in one swift and smooth movement – a Marine makes it look oh so easy, whereas after about 5 my thighs were screaming out – only 25 on each leg! Easy – ha! Sprints I get, outside, on a treadmill, on a bike, in the pool – no problem. On a machine that replicates climbing – I assure you, is not fun, especially with someone standing next to you telling you to go faster. 20 miles round the horse track in Hyde Park is not everyone’s first choice to spend the first spring like weekend of the year, but if you’re training for the Marathon des Sables then it is fairly ideal. That was my task this last weekend, but to do it two days in a row, so in total 40 miles. I did have to give it some variation, and on Saturday ran to Hyde Park from my flat along the Regent’s Canal and then the Thames Path – not quite desert like terrain and certainly more pedestrians getting in the way round the Tower of London, but it was a beautiful spring morning on the Saturday. The horse track however is pretty good terrain to practice on, and my desert running shoes were fairly well put to the test, as was my trusty 5 year old backpack which still contains grains of sand from the Sahara 5 years ago. It had done well, but the last few training runs are beginning to show, and the mesh pockets on the side are more mesh than pocket, if you know what I mean! Hyde Park is one of my favourite places to run in London, the scenery is varying and beautiful – but going round it several times does become a bit tedious, if only because the feeling of envy develops as you run past elegant folk gently strolling around on their beautiful horses whose tails gently swish at the occasional flies. They are allegedly out exercising their horses, but if that is exercise walking round at a sedate leisurely pace whilst sitting on a four legged animal then I’m mad (yes I know many people think I am!). My main issue is that the riders could have at least smiled – it was sunny and the birds were singing, spring was quite literally in the air, but no, not one smile. I admit at times my smile may have looked more like a grimace, but at least I tried. Sunday was definitely harder…I admit I drove to my gym in Soho (The Third Space), and then ran to the park, but I did have to go several more times around the horse track to make it up to 20 miles. Slightly sore knee, slightly sore thigh, dreaming of a hot shower at the end. There were two American ladies who I passed three times over the Serpentine Bridge who on the third passing I heard muttering about a sense of dejavu – I wanted to stop and explain that no, they had seen me three times, but decided to let them work it out! The park was fairly crowded on the Sunday and all sorts of people were out and about using it for leisurely or otherwise purposes…not least a group of people signed up to some sort of British Forces fitness class – I forced myself to pick up the pace as I went past them with my pack looking fairly hefty on my back. Fairly exhausted I eventually left the park and headed along Green Park, and the Mall to head up towards Soho – passing as I did at Lower Regents Street some rather exciting film or TV crew filming a period drama of some description – there were several people dressed in pre-war era style clothing with great hats, horses & coaches – but oddly all queing for their lunch at canteen trailer (obviously the horses weren’t training). Ordinarily this would have grabbed my attention and I would have stopped and gawped along with all the tourists and passersby – but the thought of a hot shower being just a few 100 yards up the road was far more enticing. Well in a little over 5 weeks I will be heading to the Sahara Desert…didn’t really think about the 5 weeks until discussing it with Jon, my trainer today. Jon Stratford – awesome trainer (www.commandoactive.com) – getting me to the start line in one piece and fighting fit – just in case anyone thinks I have it easy – he is ex-Marine and well, that should say it all, although I think his challenge to make me able to do 10 pullups is a little ambitious! 1 nearly kills me. And Brett Davison – my awesome physio, who worked with me 5 years ago, is also helping me to get to the start line in one piece – although he did mutter something today about the 800 odd competitors being escapees of a mental hospital (ha ha ha! Anyways, it’s all going well – looking for two big runs this weekend around the horse track of Hyde Park. Gradually acquiring all the kit – building the nutrition. Great biltong for sale in Borough market – mmm delicious, an absolute essential. Day 3 – well, everyone deserves a day off – and as it was blowing a complete hooley of a gale we headed to the local posh hotel for a well deserved pedicure – a true hour of pampering. My feet felt like magic. Followed by a lovely lazy day eating, drinking, sleeping, chatting and watching films. Day 4 – slightly tired legs, but once I got going found the bounce, and headed off to Ephaven, had a moment of amusement when clambering up the cliff path around New Polzeath, as a young mummy and her three boys were ahead of me and I suddenly heard the mummy shout, “quickly boys, move aside for the crazy lady!” – Does someone running with a pack really look that bonkers??? Sadly all good things come to an end, but we finished the four lovely Cornish days in style with a deeeeeelicious sunday lunch at the St Kew Inn – one of the best pubs in all the land (with rather good looking barmen as well). A great four days, thanks to my awesomely wonderful sister who cooked the most delicious meals ever – she will be sorely missed and fantasized about in the desert as we eat expedition instant meals every night! The morning was beautiful, and there are very few places that are finer to run. The air is clear, the sound of the wind, sea and occasional gulls is simply breathtaking – especially if there are very few other people sharing it with you – and apart from a very few hardy surfers (all of about 3 I counted), there was no one else about. I headed along the cliffs, puffing up the hills but feeling the promising effects of all my training with my supremely brilliant trainer Jon (www.commandoactive.com) and all the horrendously tough exercises he puts me through suddenly seemingly worthwhile as although going up the hills was tough – I was running up them. 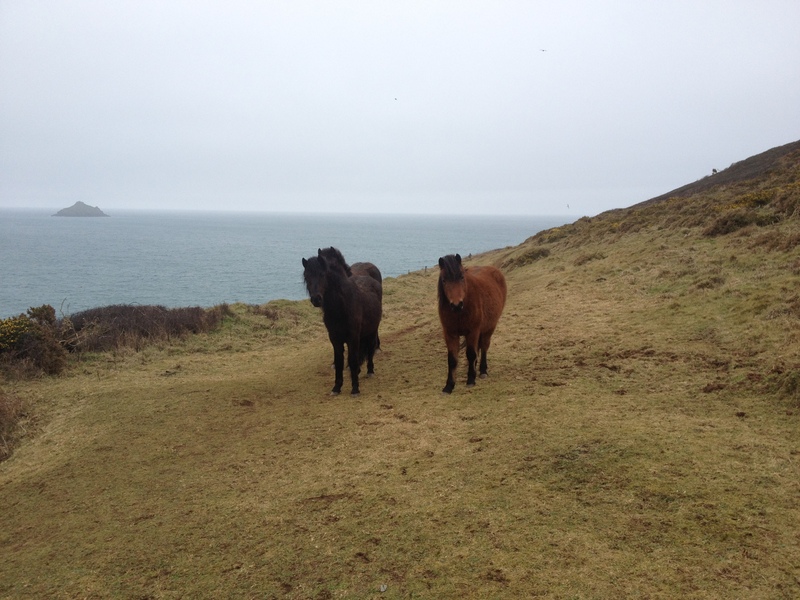 As I headed up the cliff path from Lundy towards Ephaven I did however encounter a small obstacle, or several small obstacles…. What is this mad woman doing??? 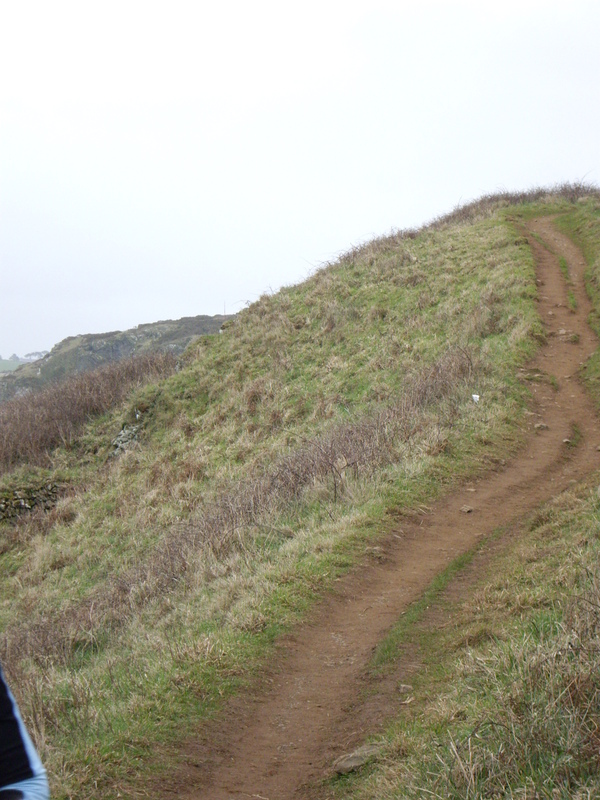 and yes, that path is quite steep – honestly, and my sister was watching so I had to run! It was then, just a hop skip and a few more miles back to the cottage where I collapsed in a heap exhausted, but actually feeling quite good – shoes ok, no blisters, tired calves from all the steps, slightly niggly knee but all ok! Again, Catherine cooked a delicious dinner of lamb cutlets with roasted vegetables, polished up with a bottle of red wine – of course after we had further boosted our cowri shell coffers again. Well folks, crafty I know, but for my sister’s birthday this year I managed to convince her that she should come away with me down to Cornwall for a much needed restful few days – cunningly leaving her two teenagers behind with Granny & Grandpa… So last week on the 15th February after a small debate about whose car we were going in and who was going to drive we loaded up and set off on our ever favourite road trip. When I say loaded up, I mean the car did look like we were going away for about a fortnight instead of just 4 nights! But as many of you will appreciate – one intends to take up running as a sport because you think it just entails a pair of trainers. I think most of the car was full of my running “crap”, with a small space for Pippin the labrador…who was squeezed in the boot between bottles of wine, trainers and wellies! We have driven down to North Cornwall a million times, both Catherine and myself, separately and together, and know the road backwards, upsidedown and with our eyes closed. But yes, and it may make some of you laugh, roll your eyes to heaven (I reiterate that I was not driving), we got lost – well, not lost as such, but we did miss a turning, turned to look at each other as we realised that we were still going down small Cornish lanes in the dark when we should have at least been approaching Polzeath – it was dark and we were talking nineteen to the dozen! We did however forget what we were talking about as laughter took over! 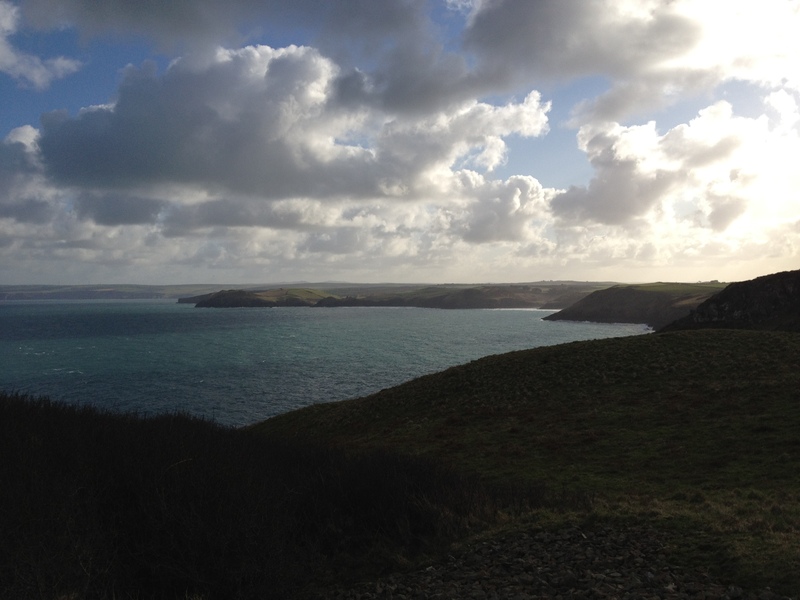 We did eventually arrive in Trebetherick to the little cottage we were staying in, in one piece…all ready for me to begin my mini self styled MDS – or my Marathon des North Cornish Coastal Path! Woke up (reasonably early), sang very tunefully to my sister Happy Birthday, and piled presents on her bed with great childish excitement. Then the running began…the weather was cloudy, but relatively mild considering the cold I had left behind in London and Oxfordshire. After some discussion with Catherine, I agreed that I would take Pippin with me on this first run, as it wasn’t going to be my longest and would be just a gentle pace. 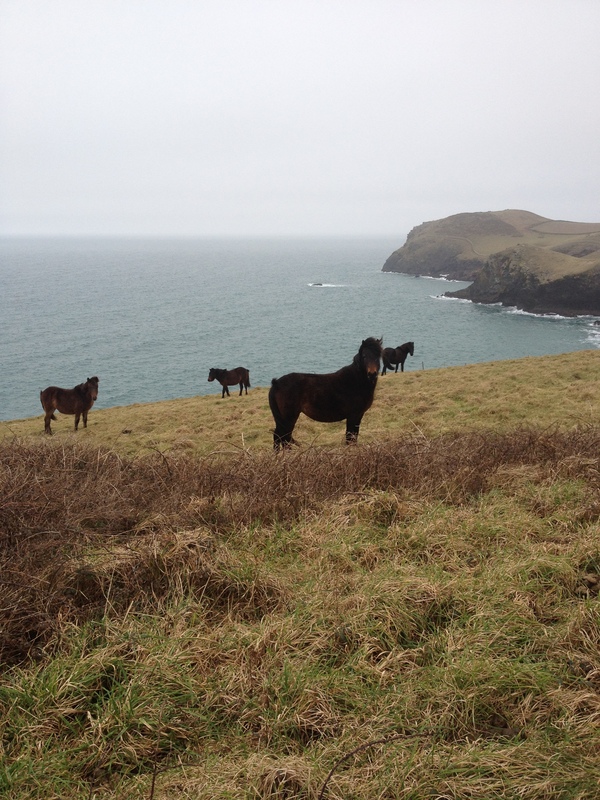 So after downing a bowl of porridge, loading up my pack and drinks Pippin and I headed out down onto the coastal path. Pippin looked a little dubious that Catherine wasn’t coming with us, but trotted alongside fairly happily beside me on the lead as we headed down to the beach along the mainstreet. However, at this point I rather regretted drawing what I saw then as the short straw of having the dog with me…the road down to the beach goes past a new housing development – it being a weekday workmen were in place and busy about their business. Pippin decided (or perhaps the motion of running decided for her) that it was an appropriate moment to go to the loo and promptly crapped all along the pavement as if she were leaving a trail for Catherine to follow!!!! I wasn’t impressed, needless to say I was a good citizen and gathered it all up into a bag provided for me by Catherine for just such an eventuallity – whilst a bunch of very goodnatured and amused Cornish builders watched and called out some appropriately ironic comments! None need to be repeated I assure you. We then deposited said poo bag, and hit the beach – beautiful, empty with the tide just beginning to come in…barely another person about. I let Pippin off the lead and we both charged across the expanse of wet sand wipping up our adrenalin towards the cliffs on the other side at New Polzeath. I think Pippin thought I was going to slow down and walk once we got to the coastal path as she did look a tad surprised as we continued running – but bless her, she kept up. We headed along the path, around the headland past Pentire Glaze towards the Rumps and headed ontowards Lundy…now I should explain that the walk to Lundy from Polzeath is about 3-4 miles (5 from the cottage where we were staying), and one that as a family we do regularly, however, from Pippin’s point of view, we don’t normally run it and there is usually a car at Lundy car park that takes us home. As we reached Lundy I was toying with the idea of continuing on at least to Ephaven which is just round one more headland, but I looked at Pippin who’s tongue was hanging out and she was puffing and decided that we would take the road back to Trebetherick…as we past the car park she looked most bemused that we weren’t stopping, and was quite pleased to slow to a walk when my phone rang. As we trotted down the hill back into Polzeath she was definitely tiring, but being the loyal and steadfast dog that she is she kept on – briefly bounced back with energy as we hit the beach again, but was definitely pleased as we crossed over a bridge on the other side of the beach and were stopped by some walkers who wanted to know why I was running with a pack! I felt like her trainer, every few steps calling out “good girl, come on, keep going, not much further”… she was rewarded with a large bowl of water, lunch and flopping infront of a log fire for the rest of the day. For me, a hot shower, a yummy lunch, then cowri shell hunting with my sister down on Greenaway until our hands were too cold – then we celebrated my sister’s birthday with chilled champagne, wonderuful moules marinieres followed by delicious Vouvray wine courtesy of my brother Nick to accompany beautifully cooked scallops. It is a secret weapon – and makes my running all the easier by having these delicious meals in the evening – I hasten to add all cooked by my simply wonderful sister…yum yum yum. We watched a great film (Midnight in Paris), and I contemplated a long run the following day as Pippin snored by the fire – as if she had run a marathon! Well folks, when my alarm went at 04:30 on Saturday morning it was very tempting to burrow deeper down under my duvet, but with a little bit of will power I got up to a freezing cold morning, visible breath and contemplating rarely warming up throughout the day. I donned my layers of running gear all toasting on the radiator, and quickly made some porridge and coffee – did a last minute kit check, nutrition check and overnight bag check. Gave a quick hug to my warm sleepy cat who looked mildly surprised at such early morning activity on my behalf, then out the door…quickly back in again to pick up my oyster card and then stood freezing at the bus stop for about 15 minutes. Arrived promptly at Waterloo Station at 6:30 and met up with Sam, another MDS runner who was busy looking for a shop that would be selling woolly hats (I didn’t want to point out the obvious that it was a tad early for shops of that kind to be open!) We jumped on the train and set off to Farnham – mmm, a wam train ride, lots of laughter and checking things off with each other that we had everything. At Farnham Station, a few other people also got off the train clearly headed for the same destination – you spot an ultra runner easily at this time of year – the only people on the platform who clearly look like they’re a sandwich short of a picnic as we stand there in our running gear shivering. We all chatted and exchanged names as we stood in the freezing cold waiting for the minibus to pick us up. You could tell how cold it was when the bus came, there was frost on the inside of the windows! We were whisked off to the start line, where we registered and picked up our runner numbers, made a quick dash to the loo (worse than Glastonbury, as the flushing systems had frozen, so the loos were just filling up – a nip round the back of the buildings behind trees was far more savoury!) and a hot cup of tea. Race instructions were given out and then before we knew it 9am was upon us and we were about to head off for 33 miles. I was running with Peter, Ahmed and Sam at the start. Well, Sam headed off straight away and we didn’t see him until that evening. It was a quite beautiful morning as we headed off along the North Downs, gentle slopes to begin with, few people around. I was quite surprised by how everyone slowed down as soon as a hill approached – they weren’t steep hills to begin with and I left Peter & Ahmed behind for a bit as I decided to just keep to my pace of a slow trot up the hills, it felt steadier and more confortable and also my body temperature stayed more regulated for me. The first checkpoint came along surprisingly quickly after about 8.6 miles, a quick cup of rather weak squash and a sausage role…but most people quickly pushed on. The sun was bright and gave off the idea of relative warmth. I was feeling a niggle in my left foot – or more a bruise from doing up my shoe too tightly, I loosened it, but I had a sneaking feeling I had left it too late! Pushing of for Check Point two, I was running with Peter, a young Dutch guy with an American accent from living in New York who is also running the MDS in April. We had a fairly equal pace and fell into step for quite a while, running alongside a girl called Carla who was running in knee length shorts (which just made me feel colder looking at her), I was wearing long leggings and loose short ones over the top! The ultra running community is a special one and so friendly, and as we were not the elite runners we were going at a comfortable pace to chat, and I lost track of everyone’s names as they passed us or we passed them. There were two guys that Peter and I kept yo-yoing with, but I think they beat us in the end! Check Point 2 was 10 miles from Check Point 1 and it definitely felt like it, but the views along the way were quite magnificent, and I could have got my camera out several times, but the competitor in me doesn’t like to stop for long! At check point 2 I tried adjusting my shoe again as the pressure was increasing on the top of my ankle, but I was aware that it was going to be a case of grinning and bearing it or popping pain killers. So I gritted my teeth, slugged down some more increasingly weaker squash from the check point, munched on some cookies and set of with Peter and Carla. We were heading off through Denbies Vineyard – which was beautiful, and the path became a long tarmac road gently sloping down….for rather a long way – it was great, and we picked up quite a good pace, but at the back of my mind was the constant niggling thought that all this downward bit was surely going to be counteracted by an uphill section, and I wasn’t wrong…Boxhill loomed into sight. 268 steps up Boxhill…felt like 2680!!!! But relief came in a long down hill gully from Brockham Hill heading down through the Coombe to Check Point 3. Someone leading up to CP 3 was taking photos of us with their Iphone. Peter and Carla were just ahead of me and I was beginning to sing to myself enjoying the yomp downhill, the erstwhile photographer shouted out that the CP was about 100meters ahead – at least that’s what I thought he said, it was about 250 meters ahead which believe me at that stage felt like a big difference. As I came into the Check Point I was aware that the sun had gone, and the temperature was beginning to drop. The race organisers were great and encouraging, and although they made very weak squash the snacks at the check points were great – pretzels at this one! Peter and I didn’t dally as we were getting cold, and we trotted straight off. Check Point 4 was about 4.5miles away, so not too far. 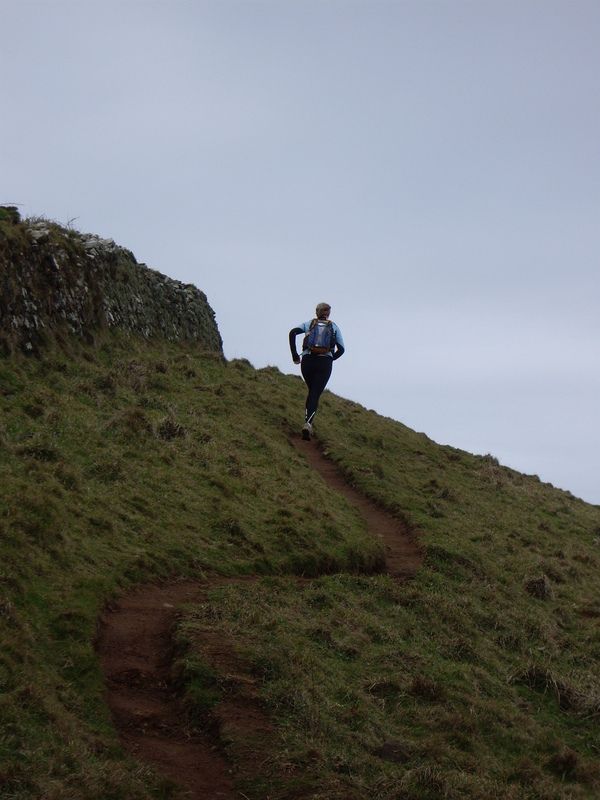 However, it did entail a BIG climb up Colley Hill – a seriously big climb, before we got to this point about 15 of us went the wrong way – a lesson in not following the herd but trusting to your own instinct. We probably lost about 20 minutes because of this, climbed an unnecessary extra hill and went at least a mile out of our way! Just for fun! It was getting cold and hard to warm up, so we just kept at a steady jog. I could feel a small hotspot on the soul of my right foot so just began hoping that a hotspot was all it was. Check Point 4 was in Gatton Car Park and they had the most delicious snack of all – liquorice sticks – not something I would have thought of but simply delicious! I grabbed a handful, stood chatting for a bit to some runners, but getting cold Peter and I, still running together set off. Allegedly it was all downhill to the finish, however by this point even the gentlest gradient was feeling a little bit like Box Hill! Peter & I were busy keeping up a steady stream of consiousness to make the miles pass (although there were only about 3 to go, the cold more than the distance was taking its effect (for me anyway). 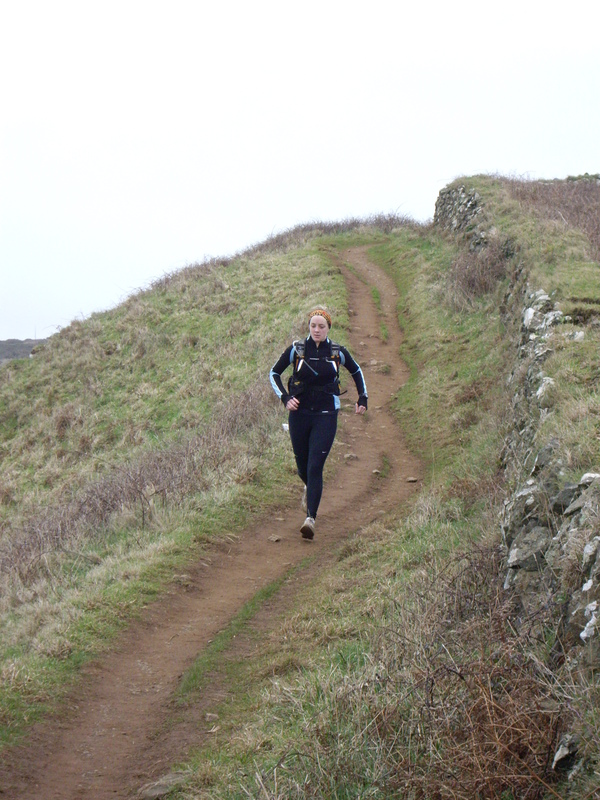 We caught up with another runner whose name escapes me completely (?! ), and ran for about a mile with him but as we turned into Merstham and headed along the road he dropped back a bit. The finish to the school seemed to take forever, but finally we turned into the school grounds to be greeted by cheers and stumbled into the school building to the already musky smell of sweatty bodies! Peter was heading home that night as he had only signed up for the one day’s racing, so we congratulated each other and parted company. I was grateful to him for being my running buddy, especially in the latter stages. Someone to look out for in the desert. I found Sam and he showed me to the gymnasium where you had to grab a space to pitch ones camping mat and sleeping bag. I was impressed. Having read the instructions on the website about an overnight bag, and being told to be reasonable in size and not bring masses I had decided I did not want to be accused of being a “girl” and packing everything but the kitchen sink I brought a very small overnight bag with just the bear essential, and my camping mat – an old one that is just a thin foam mat. However it would seem that luxury is not taken for granted – there were inflatable mattress being blown up all around me by seemingly hardy men!!!! (Wusses!) – yes I admit I had severe mattress envy, but I did play my trump card – I was the only person who had thought a hot water bottle might be useful. I may well have tossed and turned through out the night as the hardness of the gymnasium floor grew harder and harder – but I couldn’t have been warmer! I pitched my mat and bag next to Richard who I train with at The Third Space gym – he is running the Atacam Desert race in March and ran the MDS last year. After a hot shower and change into warm clothes, we headed to the dining room for the rugby and dinner, good wholesome nosh. I then bailed fairly early in the evening and headed to bed, and surprisingly as sharing a room with about 100 other folk I have to say I slept fairly well. Waking up about 5am on the Sunday morning I stayed snuggled down in my sleeping bag as long as possible until I heard enough movement from other competitors. However, sitting up and looking out of the window we were met by the sight of a different world – we had woken up to Narnia. It had snowed steadily throughout the night since about 7pm on Saturday. Richard woke up and said he was withdrawing from the race. The layer of snow would hide the path and any hazards on it and also increase how long we would be out on the course for probably by at least an hour. So I would be looking at probably 8 hours out in the snow and cold, and a risk of sustaining a twisted ankle or possibly worse. I gave it a lot of thought. Having run the MDS before, you don’t run two consecutive days of over 26 miles, and not only that I also have to remember that my day job entails me being on my feet for at least 8 hours. I’ve put a lot into this MDS, and I want to turn up at the start fit and uninjured, and I want to be able to work to the best of my ability – and if a far more experienced runner was pulling out, along with a few other guys as well, I decided that sense should take precedence. Sam and Ahmed also decided to withdraw. By the time we were dropped off at the station we heard two runners had pulled out before even making it to mile 1…the organisers were going to have a busy day by all accounts. I have no doubt that those who ran on Sunday had a spectacularlybeautiful day’s racing – the snow must have been stunning up on the Downs…but my philosophy is I am training for the desert, not the antarctic…and it doesn’t matter who says that training in the snow is perfect for the desert – they can kid themselves that it is, but I’m afraid in my experience it isn’t, I don’t think it is anything like the desert – not one I’ve been to anyway! So we headed back to London, we had a fairly long wait for the train, but this allowed Ahmed to test his stove and coffee making abilities – caught on cctv it might look like we’re setting fire to Merstham Station, but the coffee was very good – I think he’s found his job for the desert! Sitting in my warm kitchen on sunday afternoon watching the Ireland/Welsh rugby match drinking hot soup, I felt I had made the right decision. After all, it was a training run, not the final race for me, that is in the desert where there will be no pulling out. Next stop – apart from a tough training session with Jon who spared no mercy with me in the gym yesterday and put me through a tough workout, a few days down in Cornwall along the North Cornish coastal path, with my ever wonderful sister cheering me along the way (and hopefully meeting me in well situated pubs! ).